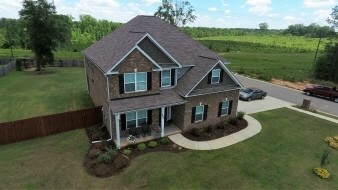 All Brick 5 bedroom 3 bathroom on .5 acres, cul-de-sac. Granite counters in kitchen and baths, Kitchen has tile backsplash, lots of cabinets, stainless steel appliances, island. Large master bedroom & bath, 2 walk in closets. 4 bdr up & 1 bdr down. Bedrooms all with walk in closets. Privacy fence, side entry garage, sprinkler system, well maintained yard, backporch, custom built pergola and fire pit. Convenient to Robins Air Force Base, Veterans High, Bonaire Middle & Bonaire Elem, neighborhood playground. Exterior Features Pergola, fire pit, covered back patio, large yard with privacy fence, lot actually goes past fenced area.